The following steps will explain how you can use deep insert with the virtual data model for OData to post complex data structures in one API call to SAP S/4HANA. How to build up a complex data structure using the virtual data model. How to write deeply nested data to SAP S/4HANA in a single call. How to write tests for deep insertion as unit as well as integration test. Step 5 with SAP S/4HANA Cloud SDK: Resilience with Hystrix. Step 10 with SAP S/4HANA Cloud SDK: Virtual Data Model for OData. Step 19 with S/4HANA Cloud SDK: Mocking S/4HANA calls or how to develop an S/4HANA extension without an S/4HANA system. A request to create an entity that includes related entities, represented using the appropriate inline representation, is referred to as a “deep insert”. On success, the service MUST create all entities and relate them. On failure, the service MUST NOT create any of the entities. This means deep insert is an atomic operation that is either successful or fails for all entities. Furthermore, it is for insert-only operations, i.e., the OData spec does not foresee any “deep update” operation yet (to be fair, it is part of the 4.01 working draft spec, however, we are not aware of any provider implementations yet, in particular as S/4HANA APIs are based on OData V2). Hint: This code goes to your <projectroot>/application/src/main/java folder, either into the default package or a package of your choice. The code shows a new StoreBusinessPartnerCommand which assumes an ErpConfigContext, a BusinessPartnerService and a concrete BusinessPartner instance upon creation time. Within the run() method, i.e., whenever the command is executed, it calls the businesspartner service with the create method and executes against the current multi-tenant ERPContext as explained in previous tutorials. The StoreBusinessPartnerCommand takes a businesspartner instance as input. This can be a potentially complex data type. 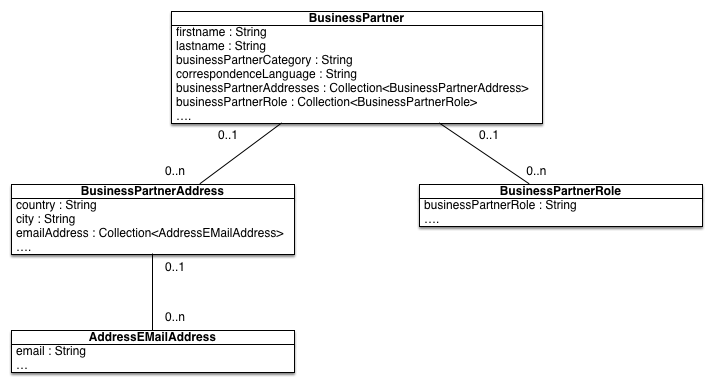 Therefore, in the next step we need to create a nested data structure based on the BusinessPartner data model. The code implements a new Servlet exposed under the /businessPartner URL path. It expects five parameters to be set: firstname, lastname, country, city and e-mail. For readability reasons, we omit here details for checking that these parameters are actually set and throw corresponding error messages to the client, an aspect you should definitively do in any productive code. Based on the five input parameters, we are creating the various entities. First, an entity to store the E-Mail Address using the exposed builder pattern method. Secondly, we create one BusinessPartnerAddress based on the city and country parameter as well as the e-mail address entity from the first step. Thirdly, we create a business partner role using the FLCU01 role (which actually stands for a customer). Fourthly, the final business partner entity which consumes the remaining parameters and the entity from the steps before. Finally, we use our StoreBusinessPartnerCommand to store the created business partner entity. 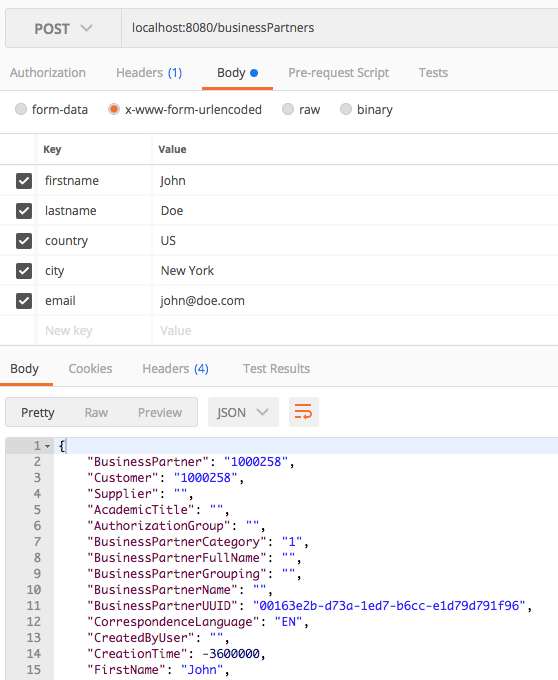 As a result we will get the stored entity which will be enriched by an ID that is given by the S/4HANA system which then is serialized into a JSON for the client. In case of an exception, we simply return the error message, ignoring any pretty printing or JSON formatting here for simplicity reasons. When we deploy the above created code to SAP Cloud Platform or using a local instance (please consider previous tutorials such as Step 3 with SAP S/4HANA Cloud SDK: HelloWorld on SCP CloudFoundry). In this example, we have used a mvn clean install && mvn tomee:run to run it on localhost. As learned in Step 19 with S/4HANA Cloud SDK: Mocking S/4HANA calls or how to develop an S/4HANA extension without an S/4HANA system, we can utilize mocking to test the functionality without an S/4HANA system to achieve code coverage, fast running tests and better testable code. Hint: This code goes to your <projectroot>/unit-tests/src/test/java folder. Hint: This code goes to <projectroot>/integration-tests/src/test/java. In addition, we are using a system alias “S4HANA” in this example, which is stored inside the<projectroot>/integration-tests/src/test/resources/systems.yml (the basics of the credentials.yml / systems.yml approach was introduced in Step 5 with SAP S/4HANA Cloud SDK: Resilience with Hystrix). 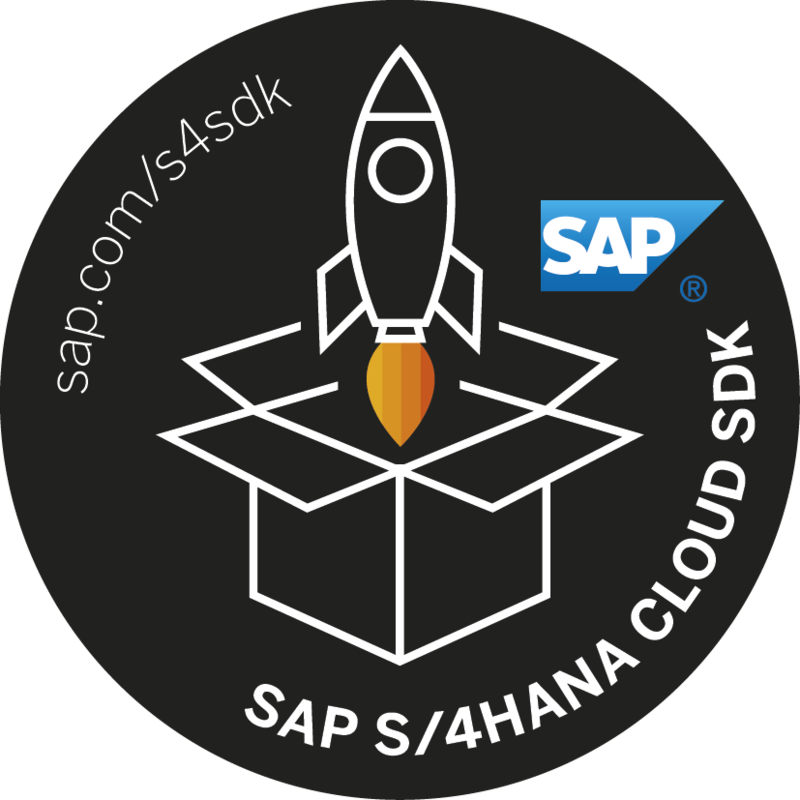 In this tutorial, we have shown how you can leverage the deep insert functionality of the S/4HANA Cloud SDK to easily insert deeply nested data to SAP S/4HANA in a single call. Besides the pure functionality, we have also shown you how to implement unit and integration tests for this functionality. Reach out to us on Stackoverflow via our s4sdk tag. We actively monitor this tag in our core engineering teams. Alternatively, we are happy to receive your comments to this blog below.